This might look like conversation that takes place over shops’ counter but it is also an inquiry that every parent must ask to oneself before admitting ones child to a private school. Since government schools are not capable of providing good quality education (despite the fact that education boasts’ of the largest portion of government’s spending more than 50% of students from government school fail in SLC, out of 100 student that admit in grade 1 only 15 reach to grade 10 to cite a few of the failures) parents choose private school(which charge varying fees) for their kids. The varying amount of fees directly associates with the quality of education. An expensive school looks to foster child’s skill (may be sports, literature, art) beyond the curriculum. This is something that the 'cheap' school can’t. This equation pre determines the child’s education opportunity, long before he/ she is born and is the reason for the social/ economic stratification that follows when he/she grows up. The “education= money” equation bothered me a lot and I would often ask myself is money which so powerful that it solely responsible for a child’s life? In rural Nepal this condition is worsened by the fact that there are only shabby government schools, (since the business oriented private schools target only cities-places where they get more students). Just because these kids were born in rural Nepal they do not get good education? Pretty unfair right! 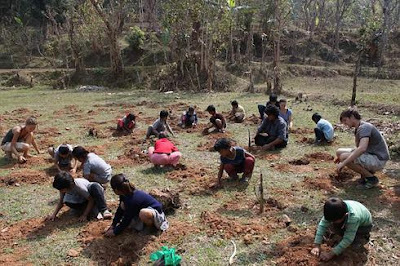 Maya Universe Academy(MUA) addresses this particular issue-providing free and yet good quality education to kids of rural Nepal, utilizing only the locally available resources to establish a self-sustainable school. Concept- Love is out currency. I got to know about MUA when I came across “Love is our Currency,” a TEDx talk by Manjil Rana, cofounder and president of MUA and their idea of a community based private school that doesn’t at all charge money but runs through love(what Simone Cicero names as gift Economy) got me really excited. What started off as a class room in tent run through friend support and bank loans is now on its way to become a self sustaining social enterprise(Maya asks volunteers visiting the schools to pay approximately $200 per month for food and shelter. This is the only money coming into Maya for now and they aim to eliminate this as well making the school completely self sustainable) with Maya Schools at 3 locations: Damauli, Sagarmatha, and Syanja and 17 new school to be built in near future. 82 students aged 6 to 11 alltogether are studying in these three station. Admittance at Maya Schools is effectively free, established initially at a rural village in Mid-western Nepal which makes it the first free private school recognized by the government of Nepal. In exchange for the children’s admittance, the parents work two days per month in operations. (the gift or love) They contribute to the production process (eg: farming), or help with construction work and other needs. The Maya School is different with conventional school in various regard, but one difference stands out over the others is that the students are taught by “passionate” teachers, people who are not working for money but people who genuinely want to educate the students and contribute. Everyone involved in the initiative are extremely passionate about their work. All the students study for free-living Maya’s objective of keeping the education open and free for all. Students learn things beyond the curriculum-skills that were already in our culture like farming, plantations. Sadly our national curriculum doesn’t incorporate these, so Maya in this regard is filling that void. It’s also different because it experiments a lot-regarding education, its recruits volunteers not just from Nepal but from all around the world so it has a diverse cultural environment where student can learn via actual observation. All the students receive books, stationeries, and school dress for no cost at all. The quality of education at Maya School is pretty decent. And the diverse learning opportunities that MUA provides to the students its not far that all parents from all around Nepal(and beyond) would want their kids to be nurtured as a student of MUA. It runs schools for kids but its educational programs for the entire community are something that impressed me a lot. They educate villagers about agriculture- one particular initiative of many is permaculture model of farming which is a self sustaining faming culture; one such example is permaculture model to raise chicken: the chicken gets food from the corps and the chicken waste is used as fertilizer to improve crop yield. The exciting prospect of Maya is that it aims to be self sustaining at the same time doesn’t charge students any money. 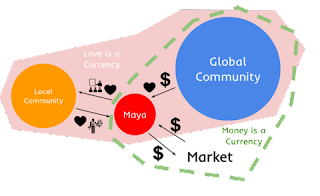 At a time when everyone is running after money Maya is a unique initiative that absolutely discards money and focuses on Human Value(that every human posses)- love for a social impact. 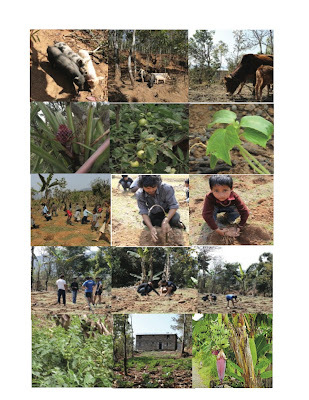 Students and their parents, foreign volunteers and Maya founders work to make the Maya Universe Academy self-sustainable through farming and food production on the schools' lands. In the SOAS TEDx talk Manjil explains that the education that they give students for free is their expression of love towards the kids and the parents in return love the Maya Academy giving 2 days of their month to the school. So regardless of who you are or what you do or how much you earn you have to give two days to the school. Its same for people who earn a lot and who do not earn that much! This prospect is really exciting because its two days of “whatever one can”(namely time hard-work and goods) do, every body’s time and work is considered absolutely equal. From the start initiators of MUA were very clear that they were not going to receive any help from National and International NGO because they wanted it to be an independent and self sustaining enterprise. The Mayans have learned from the village ways of organic farming and animal husbandry and improved upon it by experimentation and various education programs and help from fellow Mayans. It the farming that funds the entire project. This idea grew and “Maya Farm” was set up a few months ago. “Since the establishment of the Maya Farm, we have significantly increased our production sector, improving yields from our organic vegetable garden where we grow tomato, cucumber, radish, carrot, cabbage, coriander, pumpkin and many more wonderful plants. We now have an integrated animal farm where pigs, ducks, chickens and rabbits cohabit the same jungle, living and sharing the same land. To sustain, educate, and become an example in the community and the country, Maya Universe Academy has started producing rice and pineapples alongside our bananas, which will start bearing fruit this year. Around our school in Tanahu we also have orange trees” read one of their blog post. All the income generating activities of MUA is a combined effort of parents, project initiators, students, teachers and volunteers. Maya Universe Academy has thus grown into near self sustaining community and it spreading its roots in other sectors: Economy in Particular. They are giving the villagers a tangible source of income-agricultural products. Since the only source of tangible income in Maya is agriculture and the fact that it’s the same agriculture that funds nearly the entire cost of project, it has made people in the village realize that farming is a powerful source of economy. Look at this irony: they are not charging any money but having an impact on the economy of the village. Maya Universe Academy participated in Dell Innovation Challenge and with people's love reached the semi-final. Your vote and/or donation could aid Maya gain financial independence. Arun Upreti is a aspiring writer, medical student, social activist, and Cricket Enthusiast. He loves writing and promoting youth led projects. He works as a news analyst in Cricnepal.